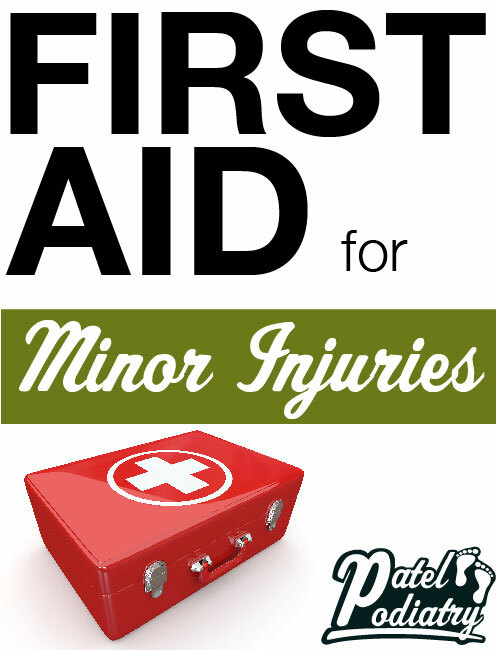 Questions About Foot Care Concerns | Family Foot Care & Surgery, LLC What is the best first aid for minor injuries? When you first injure yourself, the RICE method is the best way to apply first aid to your lower limbs. RICE is an acronym that stands for rest, ice, compression, and elevation. It’s a basic treatment plan you can fulfill at home, or wherever you are, to minimize or eliminate swelling and inflammation after injuries like a sprain. You need to rest and protect the limb to allow it to heal, so stop all activities that strain the feet. Ice the sore area to decrease swelling and inflammation in the tissues. Wrap the foot or ankle in a compression bandage and keep your limb elevated on a cushion when you’re sitting or lying down to discourage edema as well. The quicker you take care of small injuries, the more likely the problem will heal normally and easily. Let Dr. Sanjay Patel in Connecticut help you if you’re struggling with foot or ankle pain. Just contact the Family Foot Care & Surgery, L.L.C. offices in Hamden or Milford to make an appointment with us. You can use the website or call to reach us: (203) 288-4055 for Hamden, or (203) 876-7736 for Milford. Does diet affect gout symptoms? Gout symptoms and flare-ups in your feet are affected by your diet. This type of arthritis develops when uric acid crystals build up in your joints. Uric acid—and the crystals it creates—forms when your body breaks down purines in food. These purines are a protein that can be found in many different foods, particularly in animal-based products. Red meat, some poultry, and certain fish tend to be high in purines. Fructose, particularly high-fructose corn syrup, stimulates uric acid production as well. Other foods, like saturated fats and alcohol, can inhibit your body’s ability to eliminate excess uric acid and thus trigger a gout attack. Adjusting your diet with these things in mind can make a significant difference for your condition. Don’t wait until you’re in intense pain to seek help for your arthritis. Let Dr. Sanjay Patel at Family Foot Care & Surgery, L.L.C. in Connecticut help you before pain starts and find a diet that works. Use the website request page, or call (203) 876-7736 for the Milford office and (203) 288-4055 for the Hamden location to make an appointment with us. Why does my skin get so dry? There are many different dry skin causes, from environmental factors to dehydration and poor soaps. The main reason your feet dry out, though, is that they are naturally dry parts of the body. The skin on your feet doesn’t have oil glands keeping you moisturized. Instead, you have thousands of sweat glands. Sweat isn’t always enough to keep your skin moist and supple. That’s typically why your feet dry out. Other factors can play a significant role in your skin health and comfort. Extreme temperatures, whether heat or cold, and low humidity draw moisture out of your skin. Sun exposure, hard soaps, not drinking enough, insufficient omega-3 fatty acids in your diet, and soaking your feet for too long can all dry out your lower limbs as well. You need to actively moisturize your feet to keep your skin smooth and comfortable. If you have uncomfortably dry skin that isn’t improving, let us know at Family Foot Care & Surgery, L.L.C., so we can help. Use our website or call to make an appointment: (203) 876-7736 for our Milford office, or (203) 288-4055 for our Hamden location. Fractures and sprains both damage your toes, but knowing whether your digit is broken or sprained is important for treating the injury. A break involves a crack or separation of bone tissue. The affected digit is painful, swollen, red, and possibly bruised. Your toe will be tender to the touch and walking on it may aggravate the discomfort. It may or may not be crooked, depending on whether the bones are displaced. The surest way to tell whether it’s broken is to have an X-ray. Sprains have very similar symptoms. You’ll develop pain in the affected digit, particularly when you move it. It may be tender to the touch and swollen. Sometimes the toe will bruise. An X-ray can help diagnose this, too, by ruling out a fracture. If your toe is injured and you’re not sure whether it’s sprained or broken, let Family Foot Care & Surgery, L.L.C. help. Use the web request form or call us to make an appointment: (203) 876-7736 for the Milford office, or (203) 288-4055 for the Hamden office. How Do I Tape an Injured Ankle? It’s best to have an experienced specialist tape an injured ankle, but you can learn to do it at home. Taping your joint, if done correctly, helps stabilize it. Wrap the affected foot from your arch to midway up your calf with non-adhesive pre-wrap padding to help prevent blisters from the tape. Then make “anchors” for the athletic tape by wrapping two bands around your shin near the top of the pre-wrap padding and one around your arch when your foot is flexed. Be sure you don’t tape any of these so tightly you’ll lose circulation in your foot. Now, make a stirrup for your heel by stretching strips of tape from the bottom of the heel up to the sides of the calf, attaching them to the anchor tape. Close up the open areas between your arch and your calf with athletic tape, keeping your foot flexed. Then anchor everything by wrapping a few strips around your arch, heel, and ankle. If this sounds confusing, let Family Foot Care & Surgery, L.L.C. help. Make an appointment at either of our offices by calling—(203) 876-7736 for Milford, or (203) 288-4055 for Hamden—or by using our website. How can I treat a turf toe injury? There are several ways to treat a turf toe injury. Turf toe is a sprain in the ligaments that support the first joint of your big toe—the place where the toe bone meets the metatarsal. The injury needs to be treated immediately to prevent long-term pain and weakness. Ice the toe when the problem first develops. This helps combat swelling and inflammation. Wrapping your foot in a compression bandage and keeping it elevated can decrease swelling as well. You’ll need to take a break from all activities that put pressure on the big toe, particularly hard-impact sports. Wear a stiff-soled shoe or brace for a time to keep the digit stable, too. Severe turf toe may require a cast and no weight-bearing for a time, so the tissues stay still and un-stressed as they recover. If conservative measures are not helping your foot, you may need surgery to repair torn tissues. Let Dr. Sanjay Patel and our Family Foot Care & Surgery, L.L.C. staff help your toes heal. Use the website or call one of our two Connecticut locations to make an appointment: (203) 876-7736 for the Milford office, or (203) 288-4055 for the Hamden location.